I'm Not In Love, a cover of 10cc's 1975 classic, is the first single to be taken from Denise Johnson's forthcoming solo album. Having worked previously with Primal Scream, New Order, Ian Brown and A Certain Ratio amongst others, she's releasing an album under her own name for the first time. 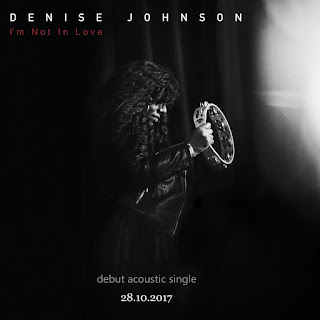 For anyone who's witnessed the showstopping performances Denise put in on the likes of Primal Scream's Screamadelica, the success of this first offering should come as no surprise. From the very first line of the song, you can hear the emotion in every single note, the rich tones of Denise's voice accentuating the song's story. Whilst we're not usually big fans of cover versions, when the reinterpretation adds a different perspective to the original, it works and here the contrast between Denise's voice and the stripped down backing does just that. Denise Johnson is on Twitter. The single is available to buy on Amazon and iTunes. TRACK OF THE DAY : Milagres - Are You Lonely?